Here's my little Anthee with her new attire, a set also made by her creator. I added a Barbie belt for a cutesy finishing touch. Of course, Patches had to be in the picture. They've gotten well-acquainted from these photo shoots. Now, here's Anthee with her funky resin wig. She almost looks like a different doll with a hair style change. Love it! wow, i thought it was two different ones!! Sooo cute! Loved the dress, as well as Tarina's belt! 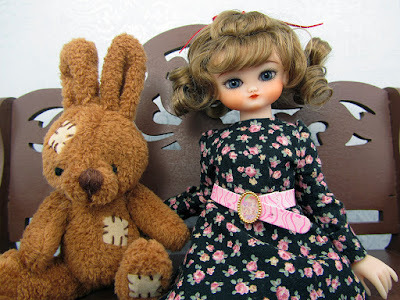 Hello from Spain: Anthée with changing seems another doll wig. I love the floral dress and pink belt. Keep in touch. How have I missed this blog???? This is a really interesting, unique little bjd, I like her! She looks porcelain!! And Poppy Parkers... and J-Dolls... oh my, I have to go through this blog!